Growing up in Delhi, I visited Raj Ghat Gandhi’s Memorial for a field trip with my middle school friends. Sitting right next to Gandhi’s grave, we were asked to write and share few words about our “father of the nation”. I pencil sketched his portrait and wrote a line recalling from my history text book ‘change begins from within’. Little I knew back then, how much that one line would influence my personal and professional life. As a change management consultant, my primary motto and mantra is “Be the Change You Seek in Others, Be the Sample, Demonstrate by Example”. 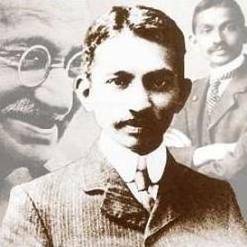 Gandhi was an exemplary leader who practiced radically different strategies. His virtuous lifestyle and courageous stories continues to inspire many globally. He constantly applied his basic ideals of truth, love and service to transform himself into one of the greatest political and spiritual leaders of the 20th century. He led a 30 year campaign of non-violent resistance and eventually led India to freedom from British rule in 1947. President Barack Obama inspired by Gandhi commented, ‘Throughout my life, I have always looked up to Mahatma Gandhi as an inspiration, because he embodies the kind of transformational change that can be made only when ordinary people come together to do extraordinary things’. Here’s more from Wall Street Journal India where Obama quotes Gandhi. Transformational change begins with constant awareness. By making people aware of the facts over and again, we can provide them with choices – to choose good or evil. Given a choice, people naturally desire to share goodness, no matter how hard it may seem. Human beings are naturally wired to desire love and peace. The key to lasting positive transformational change is continuous reinforcement and visible rewarding system. Think Different…. Because the people who are crazy enough to think they can change the world, are the ones who do. Trailer to the movie Gandhi starring Ben Kingsley – Truly Inspiring! Thanks for sharing your enlightening thoughts Minnie!